Have you ever bought a puppy with a pedigree? If so, you know that the pedigree can be a predictor but does not guarantee the animal will grow up smart, cute or won’t bite you. All puppies are not the same, even from the same litter. Diamonds likewise, even with exactly the same grading will look and display differently. Just like a puppy pedigree, a cert from a top lab like the AGS or GIA is a pretty good predictor of what a diamond will look like. Still it is no guarantee that the gem will in fact live up to that grading. You can be assured that it will be PRICED to its grade regardless of the face-up beauty. Face-up beauty is our term for how the diamond looks when mounted in a ring, that is, table to the top or face up. You see a lot of the diamond’s grading is done from positions that the viewing public will never see. For instance, color is judged from looking at the bottom of the stone. It’s clarity, by studying the interior under ten times magnification. Who carries a microscope around? Very often we see properly graded stones that either rise above or fall well below the bar set by that grade. The diamond market today is no longer ruled by DeBeers. Today the certing agencies could be said to set the price of diamonds via the G.I.A. grading system. This means that a stone is priced based on grades determined in a scientific state rather than the actual gem’s beauty. Buying a diamond this way is like picking Miss America after reading stat sheets without ever seeing the girls. Inches and pounds become the standard ignoring poise and intelligence. We think that is just a little shallow. The Four C’s are very important. But they are only a single facet of many that must be considered when buying a diamond. We understand. That is why we say and stress that our diamonds are selected for complete beauty. In today’s challenging economic environment, your budget is really important. Getting good value, without sacrificing long-term satisfaction, needs all the skills your jeweler can bring. You should not have to become a diamond expert, just to purchase one. More than ever the experience, judgment and sensitivity of your jeweler are called upon to help you make a good choice. At VandenBerg Jewelers we have those qualities plus the ability to explain clearly what drives our advice. In our opinion, the best deals in the diamond world of today are the mid-range graded stones that face-up competitively with so-called “better stones”. We have the experience and suppliers to locate those great gets. 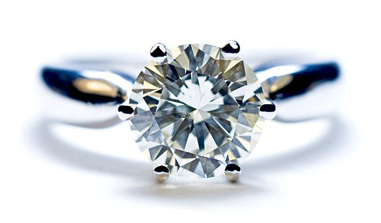 We automatically custom shop diamonds based on your desires and budget. By the way, we will not treat your budget as a starting point. We believe you have picked a figure that works and our job is to stay inside of that. We will help you pick, not from a paper list, but from actual diamonds, a stone that you will cherish for years to come. 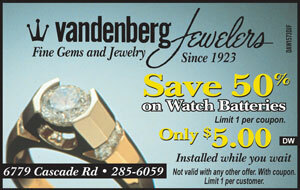 At VandenBerg Jewelers we want getting engaged to be a fun, memorable time not a stressful journey.